Erlanger City Administrator Marc Fields announced Tuesday night that the resurfacing work long scheduled for the railroad underpass just south of the Kroger on Dixie Highway and just north of the intersection with Commonwealth Avenue will begin on September 8. "Anyone traveling on Dixie Highway along that area will have to expect long delays," Fields said. "Stay off (the highway) if you can. It is going to be a mess any way you look at it. It will be worth it in the end." City Engineer Jim Viox said there is no time limit on the project because there is no way of telling what the workers will find as they dig up the road. The certain things are that the work will start Tuesday, September 8, the work will go on all day, and the traffic will likely be so bad the police will have to help direct the cars. 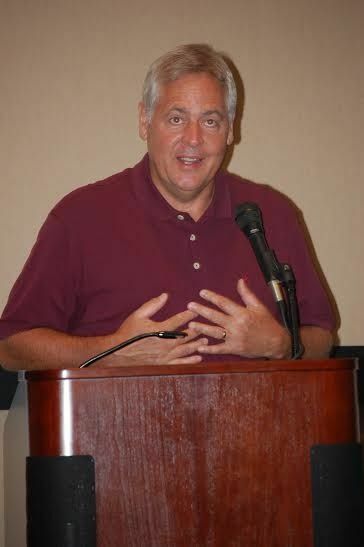 Tyson Hermes made a statement in his mayor's report, thanking the previous administration for their work, and singled out Marc Fields, Greg Engelmann and Missy Andress for paving the way for the tax rate reduction. Hermes also said he looked forward to more rate reductions down the line, and said even though the road would be difficult, his dad always told him nothing worthwhile comes easy. Council member Corine Pitts made a statement noting that the city was working toward the tax cut, keeping the rates the same for several years. She also pointed out that Erlanger citizens are the recipients of a lot of services, not the least of which is ambulance services. Council also passed a text amendment adding hospitals as a permitted use in Highway Commercial 1 and 2, and in Industrial Park 1, and Business Park 1. This was a unanimous vote also. A third ordinance was read for the first time organizing all of last years' ordinances into a code of ordinances. Council passed a Municipal Order that will codify all of the city's ordinances, a measure that hasn't taken place in 35 years. Finally, a resolution was passed allowing more security cameras into parks and places owned by the city, as well as intersections where the police get the most calls.This will be paid for thanks to a grant from the U.S. Department of Homeland Security. Brian Collins came to the meeting to introduce himself as the owner of Cherry Hill Swim Club and to ask for help from anyone in the city in boosting interest in the club. Even though the swim club is in Boone County, it is also in the City of Erlanger. 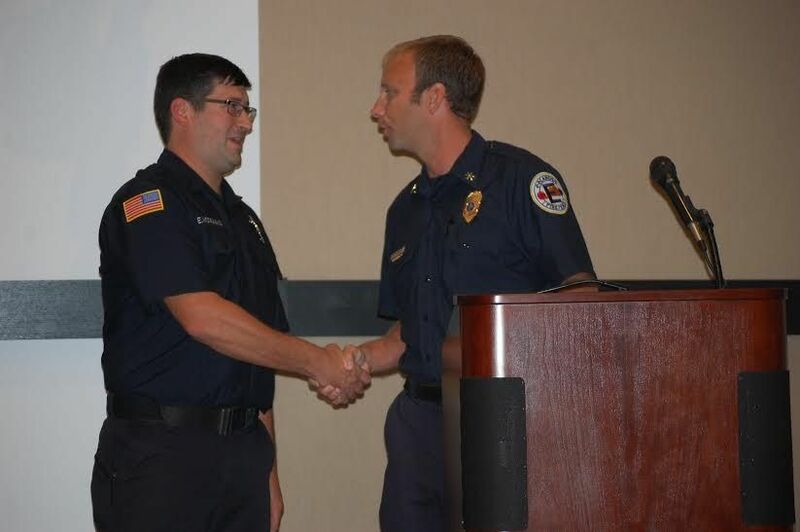 In the fire department, Eric McDonald was given his five-year pin by Captain Brian Robinson. Several citizens came to speak. 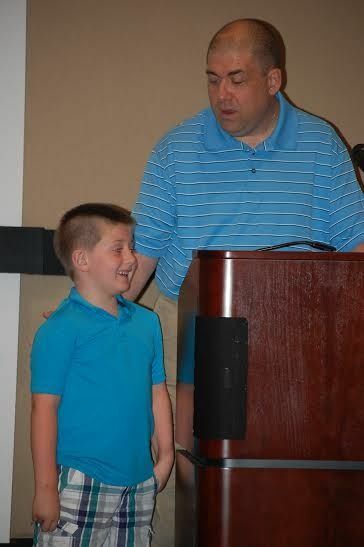 James Brown and his son Conner, 6, told council that the city sponsored camp out was "awesome" and "great" and they hope it will continue. This was a new program tried out by the new Recreation Director Kim Wolking. Casey Williams spoke for several of his neighbors on LaHinch, a street just off Turkeyfoot near the Brightleaf subdivision, to complain of crime on his street. He wants the city to put more street lights near the bottom of the street, and would like the police to step up patrols. Bill Steimer, of Misty Creek, came to ask when the second half of the railroad crossing on Stevenson road would be finished. The answer was the city wasn't sure. Cathy Kroger, a resident of Redbud in Cherry Hill, came to voice her concern and fears about a pipe that was causing the road to sink and her yard to sink. She strongly urged the city to do something before a child was hurt by falling into the parts that have sunk, and told them they would then have a lawsuit on their hands. Council set the Trick or Treat hours for the city on October 31 from 6 to 8 p.m. Mayor Hermes announced that there are two 9/11 ceremonies, one in Crescent Springs at 6:30 p.m. and one in Florence at the Elks lodge at 6 p.m. It was announced that the 24th Heritage day will be on September 20th from 1 to 5 p.m. at Depot Park, and immediately following Lieutenant Ric Bohl said the volunteer fire department will hold a Putt for the Caboose at the Erlanger Putt Putt. Proceeds will go toward the restoration of the Erlanger caboose, which is scheduled to go down to Progress Rail this week.